Whistleblowers say that the fire chief, mayor, and city council failed to advocate for sufficient resources. Oakland Mayor Libby Schaaf discusses the fire department at a Wednesday afternoon press conference. To Oakland’s fire inspectors, the Ghost Ship warehouse really was invisible: The extremely dangerous building sailed unseen for years, evading fire-safety inspectors until it burned on Friday night. Last Saturday morning, as first responders began to enter its smoldering rubble in search of victims, several Oakland Fire Department employees looked up the warehouse’s fire-code inspection history. But when they attempted to pull records for 1315 31st Avenue from their own fire-prevention bureau’s files, they discovered nothing. “It's not even in the system,” one firefighter said (he asked not be identified for fear of retaliation from the city for speaking out). Since the tragedy, he and five other firefighters have explained to the Express how the department's building-inspection program, which should be the front line of fire prevention and safety, is dangerously under-staffed and disorganized. In fact, there are just six fire inspectors for the entire City of Oakland, left to investigate more than 4,200 commercial and residential properties each year. These firefighters also blamed Oakland Fire Chief Theresa Deloach Reed for failing to hire for key leadership positions in the fire prevention bureau. For years, the OFD also has been chronically under-funded. Firefighters told the Express that they’re made to work long, grueling overtime hours, because there are too few emergency responders to adequately protect the city without extra shifts. These staffers say leadership denies them crucial training, as well — or makes them pay for it out of their own pockets. They accused city offices of not communicating with each other, to the extent that there is seldom follow-up when a dangerous facility is reported by a paramedic or firefighter to city building inspectors. Oakland’s firefighters have warned elected officials about all these problems, since 2012, but little has been done to fix things. They fault Oakland’s top officials, and especially their own chief. But some say Reed isn’t to blame. Councilmember Desley Brooks said OFD’s mismanagement and underfunding pre-dated the current chief, and that the current administration has failed to remedy the situation. “I’ve personally told [City Administrator Sabrina Landreth] about need for funding a dedicated training program,” Brooks said about one of the department’s many understaffed programs. Others say that OFD’s problems originate throughout the entire city government. “Without rushing to point blame there are many elements that deserve scrutiny in the aftermath,” said Councilmember Abel Guillen. He cited understaffing and “excessive use of overtime” as two festering issues. Councilmember Rebecca Kaplan says the buck stops with the city administrator and Mayor Libby Schaaf. Regardless of who is responsible for the Oakland Fire Department's problems, everyone agrees that it has suffered from bad decisions made by the city’s top leaders. Multiple firefighters told the Express that the most conspicuous failure by the city to maintain a fully functioning department is that two key jobs have gone unfilled for years: the fire marshal and the assistant fire marshal. The fire marshal ensures that the city's code is followed. Inspectors who work under the fire marshal are tasked with scouring Oakland’s large buildings and facilities, ensuring that they're outfitted with things like proper sprinkler systems, smoke detectors, emergency lights, extinguishers, and other safety measures. Oakland's current fire marshal, Miguel Trujillo, was just hired in April 2015. For four years, the city didn’t have a dedicated fire marshal. Instead, Reed appointed herself, as well as several deputy chiefs at various points, as acting marshals. But members of her own department say there's no possible way these temporary leaders could effectively supervise staff and modernize the bureau while also running the rest of the department. The fire-prevention bureau should also have an assistant fire marshal, who oversees its team of inspectors. But in October 2008, the City Council froze funding for this position. They blamed budget shortfalls. There were acting assistant fire marshals who filled this job during this period. But the longest one on the job was only there for 90 days, according to OFD sources. The council finally decided to restore funding for the position in 2014, according to budget records. Yet the city to this day still hasn't hired an assistant fire marshal. Schaaf and Landreth did not respond to emails seeking answers as to why these key positions have gone unfilled. Reed told the Express in an email that the job of fire marshal had previously been filled by a deputy chief, who oversaw both the fire-prevention bureau and the support-services bureau. When this person resigned in 2013, the job was unfilled until the council approved funding for a new designated fire marshal in 2014. “It took two rounds of hiring to fill this position,” she wrote, causing a delay until April of this year before the new fire marshal was in place. Reed claimed that the city only un-froze the assistant fire marshal position in July of this year, freeing her up to hire someone new. The auditor’s report noted that, from 2011 through 2013, the number of budgeted positions in the vegetation-management unit had been slashed in half, from six full-time employees to six half-timers. The report also stated that trained inspectors didn’t work during the key months of the summer fire season. This audit also revealed that as many as 35 percent of OFD staff who performed inspections failed to attend training sessions. Sources in the department say that the building-inspection duties of the prevention bureau suffer from the same problems — too much work, too little staff, no leadership. Vegetation management in the hills has gotten more attention, however, because of the legacy of the 1991 firestorm that killed 25 people. And affluent homeowners in the hills are better able to advocate for themselves compared to those who live and work in Oakland’s flatlands. A 2014 memo sent by then City Administrator Deanna Santana and Reed to the mayor and city council explained that hiring a new assistant fire marshal would be able to address the shortcomings of Oakland’s fire-inspection program. And that's not counting buildings such as Ghost Ship, which wasn’t even in the department's database. According to public records — including building-inspections and police reports, and code complaints — the Ghost Ship warehouse should have been referred to the department for an investigation a year ago at the very latest. According to budget records, Oakland currently is budgeted for eight fire inspectors. But fire department staff told the Express that there aren’t actually this many on the job. Reed confirmed that Oakland only has six inspectors right now. Similar cities have more inspectors. Sacramento, for example, employs fourteen full-time inspectors, and Bakersfield has a team of sixteen. An Oakland firefighter with extensive knowledge of how fire inspections are conducted said that the city needs at least three-times the number of inspectors it currently has to be effective. Oakland inspectors also don’t work on weekends, times when there are many events that require day-of inspections — and many more non-permitted shows. And another problem with Oakland’s fire-inspection bureau, say firefighters, is that the inspector jobs were civilianized years ago. They don’t work alongside any firefighters. And the result is that, when firefighters spot possible code violations while going about their everyday tasks and report them to the fire-prevention bureau, they never hear back. One firefighter said he has reported apparent code violations, only to see the problems remain unabated for weeks, months, and, in some cases, even years. The database used to track properties and inspection records has been “a mess” for years, according to an OFD employee with direct experience of the prevention bureau’s troubles. “There’s no proactive approach by the fire department to figure out what’s in the city, what kind of buildings and facilities, and what’s in the database, and what’s not there,” he said. This failure of the fire-inspection team comes despite a 2014 report by the Alameda County grand jury, which among other criticisms dinged OFD for neglecting to inspect more than 4,000 Oakland buildings. According to other OFD sources, inspections were conducted through a flawed process that may have left many buildings unexamined for years. To conduct inspections, staffers print out a list of buildings from the OFD database. But the addresses are sorted in a “jumble,” a source explained, which forces inspectors to drive around town to examine properties that are not nearby one another. Sources said this had the potential impact of overlooking properties with potential fire-code violations — even if a fire inspector noticed a problem while passing by, simply because it wasn’t on that day’s list. In other words, Oakland’s fire-prevention bureau bases its work off bad and disorganized data. “We were jumping, jumping, jumping,” one fire department employee described the process of skipping over buildings. “We don’t know if a property was inspected” or not. The system was only recently improved, say sources in the department, but only after some businesses complained of being inspected multiple times within a year. The department assesses $186 fees for each inspection, and some businesses called their councilmembers to complain that they felt like they were being shaken down for money, rather than helped with fire-code compliance. “Safety’s an afterthought,” one firefighter lamented. Another member of the department said the aggressive inspections were due in fact to budget reasons: OFD administration assumed they would be collecting several million in fees, but when revenue fell short, there was more pressure to inspect even more buildings. The Oakland Fire Department is the most under-staffed department in the city, according to budget and personnel records. And its own members say it’s filled with young and relatively inexperienced first responders. According to city records, Oakland officials have responded to their own under-staffing of the department by forcing firefighters to work long, mandatory-overtime hours. One document obtained by the Express reveals that OFD’s short-staffing has potentially effected the ability of Oakland’s first responders to prevent fires and care for the injured. According to a settlement agreement between the city and the firefighters’ union signed in November 2015, Oakland’s city administration and the fire chief had members of the department working overtime in ways that violated its contract with the union. For instance, on at least one day in August of last year, the city forced fire paramedics working at Station No. 13 to work in “dual roles,” as both medical and fire suppression staff. The effect was that the station didn’t have enough personnel on hand to simultaneously respond to a fire and medical incident. Station No. 13 is located on Derby Avenue in the Fruitvale, just a block from the Ghost Ship warehouse. Station No. 12 on Alice Street in Oakland’s Chinatown is responsible for responding to marine emergencies in the Oakland estuary, including capsized vessels, drowning persons, fires and other hazards. The station has been short-staffed on repeated occasions, according to records and interviews. In another instance, city officials left Station No. 23, located at 7100 Foothill Boulevard, under-staffed for eight hours on a day in November 2015. On May 21 of this year, an entire block of businesses just a few hundred feet away from the station burned to the ground. It’s unclear what the staffing level was like at the station on that date. One firefighter who spoke to the Express on the condition of anonymity said that one reason this short-staffing hasn’t grossly endangered the public is because battalion chiefs can call on other stations to simultaneously respond to emergencies. But the constant overtime and multiple jobs that each firefighter assumes has caused dangerous levels of fatigue and damaged morale. One firefighter said she was concerned that tired paramedics could administer an improper dose of medicine in the field, or an engineer would be too sleepy to drive their station crew to an emergency. “Imagine trying to calculate the right dose of something based on a person’s weight, using your charts, when you’re fatigued,” she said. According to internal staffing reports, OFD has been budgeted to maintain a force of 168 firefighters and 93 paramedics this year. The department is currently short six paramedics, and seventeen firefighters. It is also supposed to deploy nineteen firefighters at the Oakland International Airport, but there are only seven on the job currently. The department is also short eleven captains, seven lieutenants, seven engineers, and lacks adequate staff in several other positions, for a total shortfall of 62 sworn officers. A staffing report presented to the city council just last month reveals that 12 percent of all firefighter positions in the department are currently unfilled. By comparison, the Oakland Police Department has only two vacant positions. The lack of people power stems back to budget cuts forced on the department in 2009 by the City Council. The city’s revenues cratered by $100 million, and managers struggled to keep the proverbial wheels from falling off every city function. For some reason, the Fire Department was hit with the heaviest cuts — and the mayor and city council haven’t attempted to rebuild it with the same zeal with which they’ve approached OPD and other city agencies. As the department has attempted to grow, other problems have emerged. According to several firefighters involved in training, about one-quarter of all Oakland firefighters have only been on the job for 18 months or less. Unger of the firefighters’ union estimated that as many as half of Oakland’s firefighters have been on the job less than five years. “We now have so many new people coming on board all at once, it creates so many problems,” said Robertson, the union president. In fact, firefighters often have to spend their own money, or use vacation time, to train themselves for specialized jobs, said two other firefighters. One of these specialized roles is in the technical rescue team. Members of this group are experts in structural engineering, carpentry, heavy equipment, and other skills necessary to dig and search for people trapped under rubble, or to recover the remains of people from caved in buildings, as was the case with the Ghost Ship fire. A firefighter said that the standard for most other major city fire departments is to have an entire dedicated training division, whose leaders work full time to teach others useful skills. OFD has no such division. “I think it’s getting worse,” he said about the department’s training efforts, adding that, earlier this year, the department had to stop conducting live-fire trainings at its own fire tower, located next to Interstate 880. Members of the department determined that it had become structurally unsafe. Its closure hampers OFD’s ability to teach new members how to safely enter a burning, multistory buildings and deploy equipment in confined areas. “We are on a shoestring,” Unger said. According to the firefighters interviewed for this report, all of these problems originate in mismanagement by the Fire Chief Reed. Together, they assembled a long list: a failure to secure more funding for the department, and to build its training and inspection programs. It has also resulted in the department being stripped of tax monies and self-funded programs. Last year, for example, OFD lost control of its hazardous-waste-inspection program, due repeated failures to safely store toxic garbage, illegal contracts to ship materials, and mismanagement of funds. The state spent several years attempting to bring the program into compliance, but ultimately stripped OFD of the function and handed it to Alameda County, costing OFD $3 million a year (see “Oakland’s Toxic Failure,” our cover story from November 2015). One firefighter told the Express that OFD had an opportunity several years ago to apply for a grant that would have funded part-time medical instructors. These instructors would have trained OFD personnel on emergency-medicine procedures. They also would have offered medical training to the community. It would have been funded by the grant and small fees paid by members of the public seeking first aid trainings. But according to the firefighter, Reed’s office did not sign off on the grant. The same firefighter said Reed refused to have OFD campaign for the special tax that funds the Wildfire Prevention Assessment District, an area of the Oakland hills requiring extra inspections and other services to avoid another hills firestorm. In 2013, voters ended up not renewing the tax. The vote margin was three-tenths of a percent short of what it needed to pass. Other crucial programs are under-funded or not pursued at all by the chief’s office, say the department’s rank-and-file. When the massive Brooklyn Basin development was announced several years ago, for example, many in the fire department thought they should ask the developer, Signature Properties, to help pay for construction of a new fire station to serve the 3,000 plus new residences. At the very least, firefighters hoped that Signature would agree to build specialized infrastructure the department could use, such as hydrants for fire engines to recharge their holding tanks with saltwater from the bay, just in case an earthquake knocked out the city’s water mains. “This was something the chief didn’t even entertain,” claimed one firefighter. The same firefighter said one of the most glaring examples of poor planning and bad management has to do with OFD’s academies. Reed doesn’t actually write a budget for fire academies. Rather, the academies are paid for using overtime, an expense the department has been criticized for. According to several firefighters with direct knowledge of the department’s training academies, current firefighters are taken out of their jobs to fill instructor positions. Off-duty firefighters are then called in to fill in for the absent instructors at stations. This “backfill” process results in large and growing overtime expenses. Reed did not respond to these specific criticisms. Councilmember Kaplan said she supports the firefighters’ critiques. But she added that the department’s understaffing isn’t as much a result of budgeting too little for the department as it is a failure of the city administration and mayor to prioritize hiring. She said the police department has gotten a lot of attention from Schaaf, while the fire department has been left as an afterthought. “They have the legal authority to tell the fire chief to hire more bodies,” said Kaplan, adding that the council can’t order a department head to fill budgeted positions. Schaaf did not respond to a request to discuss issues brought up in this report. The firefighters’ union isn’t the only organization to register complaints against the chief. Last December, a group of Oakland hills residents sent a scathing letter of no confidence to Schaaf, Landreth, and other city officials regarding OFD’s inspections program. The North Hills Community Association, which is located in the brushy and eucalyptus-crested terrain spanning Berkeley and Oakland, wrote that “the Fire Prevention Bureau seems to have borne the brunt of budget cuts. The workload for existing staff has risen to impossible levels.” They noted many inspections were performed by regular firefighters who lacked proper training. They also said that OFD doesn’t maintain a list of qualified candidates for the inspector jobs, so when an inspector leaves, the city has to go through a lengthy process to find a replacement. “Oakland is at risk of losing its institutional memory and experience,” they warned. Although they were focused on their homes, set in the tinderbox of the hills, they were critiquing the same fire department and bureau tasked with making sure the homes, workplaces, and entertainment venues of Oakland’s flatlands are safe. They laid blame on Reed’s doorstep, too. After the Ghost Ship tragedy, that calamity is now a reality. Only time will tell whether any of the problems afflicting Oakland’s fire department, and especially its prevention bureau, played a role in leading up to Ghost Ship. Investigators are still combing the scene in an effort to determine its cause. The city only began releasing code-enforcement reports written by inspectors in the Planning and Building Department earlier this week. Police and other incident reports are only beginning to surface. Piecing together the property’s troubled history will take weeks. 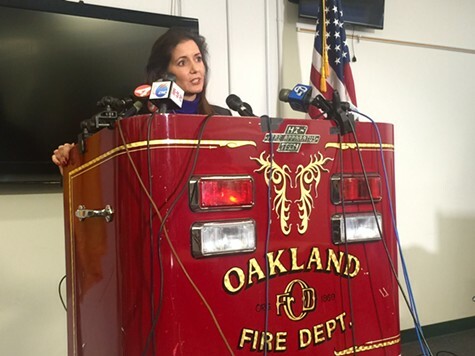 Schaaf announced at a press conference on Wednesday afternoon that she has called on a team from the National Fire Protection Association to conduct a review of Oakland’s fire code and building-inspection process. She also stated that she will not scapegoat city inspectors. “While we still don’t know what caused the blaze, there are lessons we can already take away about how to increase safety in our community,” she said at the press conference. And, despite the apparent problems besetting the Oakland Fire Department, it’s worth noting that all of the firefighters and city officials who spoke to the Express for this report said they feel OFD’s efforts to extinguish the Ghost Ship fire, save lives, and respectfully recover the remains of those who perished, were extraordinary — in spite of all else.